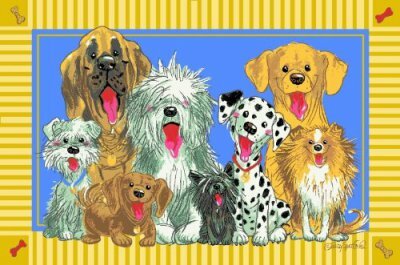 Brighten up any area with this dog rug featuring eight funny-faced dogs! This lively rug has smiling dogs of all shapes and sizes, each with bright pink happy tongues sticking out! From a shaggy little Scottie to a big wrinkly bloodhound to an adorable Old English Sheepdog, all these dogs are sure to make you smile. A yellow stripes and bone border completes the look of this 3 by 5 foot rug. For more information about the smiling dogs rug, click here.